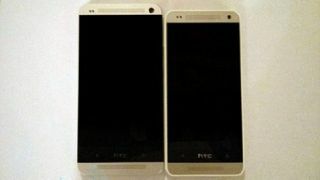 We recently glimpsed a picture of the alleged the HTC One Mini, although all we could really tell from the grainy image was that the handset would be a lot slimmer, which was hardly an earth-shattering revelation. But now we've got more information on some of the more interesting features the phone will be bringing thanks to a UAProf (that's a User Agent Profile) available on HTC's website, which details a 720p display. As you can see below, the string shows that the display will have a 720x1280 resolution on its 4.3-inch display, putting it ahead of Samsung's competing shrunk-down S4 flagship, the Galaxy S4 Mini. There's also a nod to the Android 4.2.2 Jelly Bean OS (further down in the profile), which is an upgrade to the HTC One's Android 4.1 offering. We can also pretty much confirm from the new information that the small HTC One will definitely be called the HTC One Mini. Again, not a huge surprise there, but good to know. While nothing has been confirmed, the handset is rumoured to be powered by a 1.4GHz dual-core processor with 2GB of RAM and 16GB of internal storage. Earlier this week, Bloomberg reported that the Mini could arrive this August.